Spring has officially sprung! March 21st marked the first day of Spring and the beginning of sunnier days. If you are sick of the cold of the winter, as most of us are, consider purchasing some spring temporary tattoos from TattooFun.com. These temporary tattoos will put a “spring” in your step as you wear them. Additionally, you feel warmer wearing them as the days heat up. If you are looking for spring temporary tattoos consider the following options. With spring comes the blooming of flowers all around us. Show your love and appreciation for all the flowers with our Flower Power Metallic Pack. This pack features a variety of flashy flower temporary tattoos. Wear a large metallic flower temporary tattoo on your back. You could also wear a small hibiscus flower temporary tattoo on your shoulder or cheek. Also featured in this Spring temporary tattoos pack is metallic flower armbands. 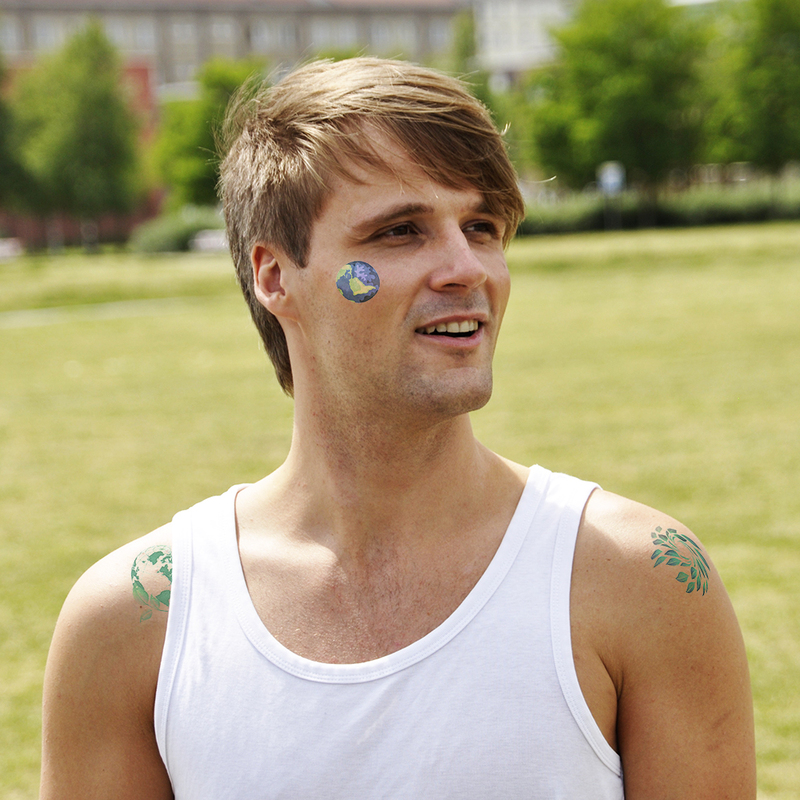 All of these metallic Spring temporary tattoos will flash in the sunlight. So what better time is there to wear them than when the sun is coming out after a long winter? 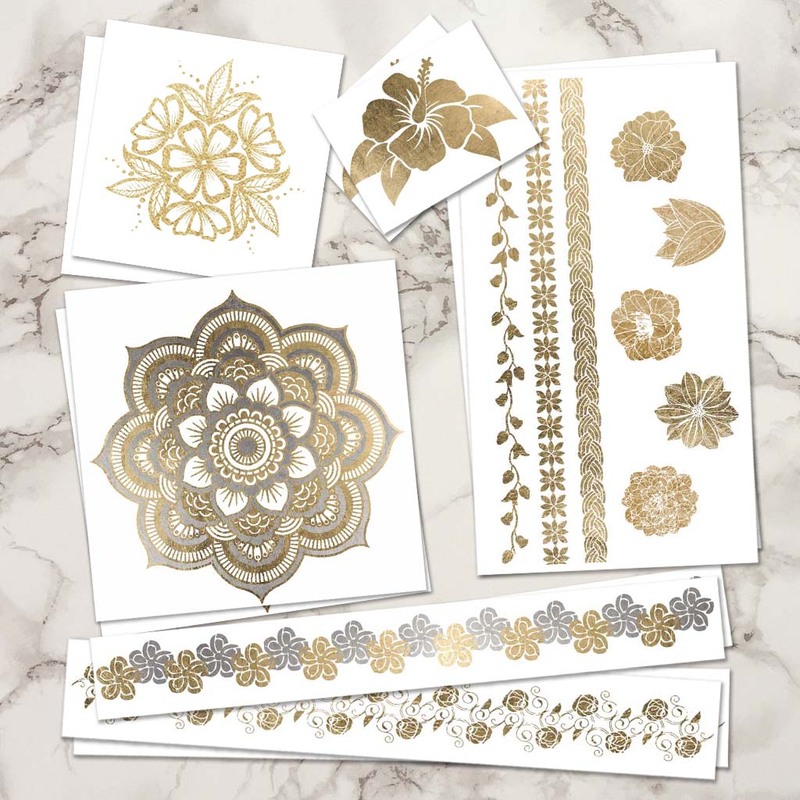 If you aren’t a fan of metallic temporary tattoos consider purchasing our Flower Power Pack of Spring temporary tattoos. 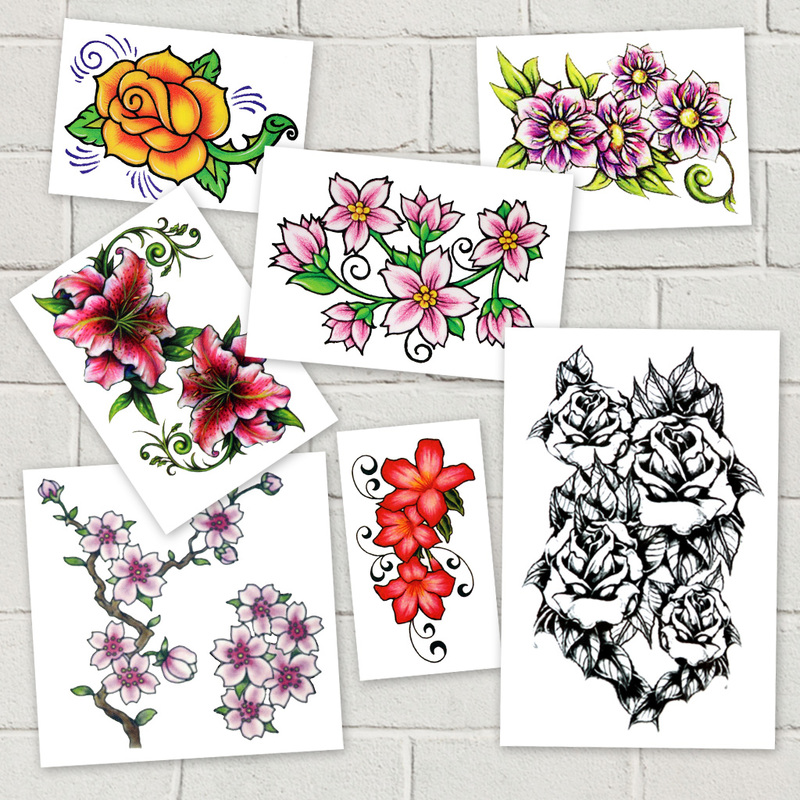 This pack features a variety of flower tattoos in many vibrant colors. You can wear the large black and white roses on your back or leg. There is also a small yellow rose you can wear on your shoulder or cheek. Additionally, this pack features orchid and hibiscus flower Spring Temporary Tattoos. Wear these flower temporary tattoos out as you admire all of the new flowers springing up from the ground. 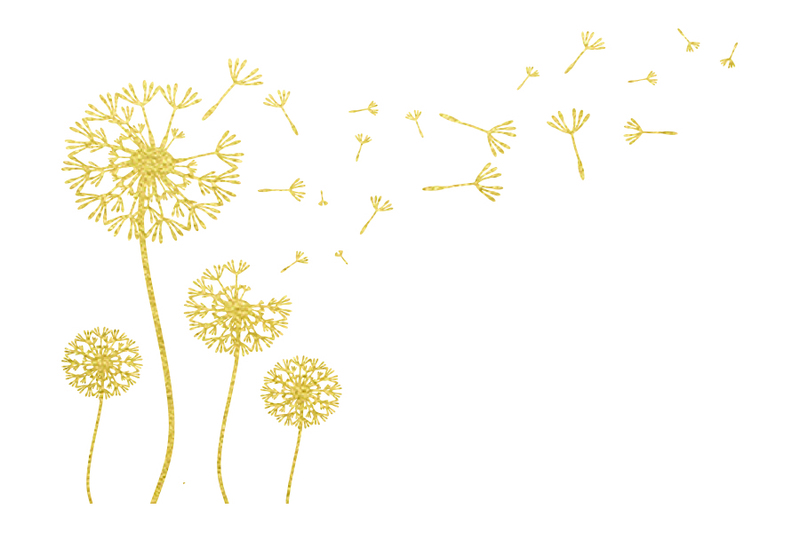 What better way to feel connected to the earth and her seasons than by wearing these Spring temporary tattoos? In addition to flowers blooming in Spring, you will also start to notice butterflies roaming around more and more. Show your love and appreciation for the winged creatures by wearing butterfly temporary tattoos. You may want to consider purchasing our Butterfly Pack of Spring temporary tattoos to do just that. 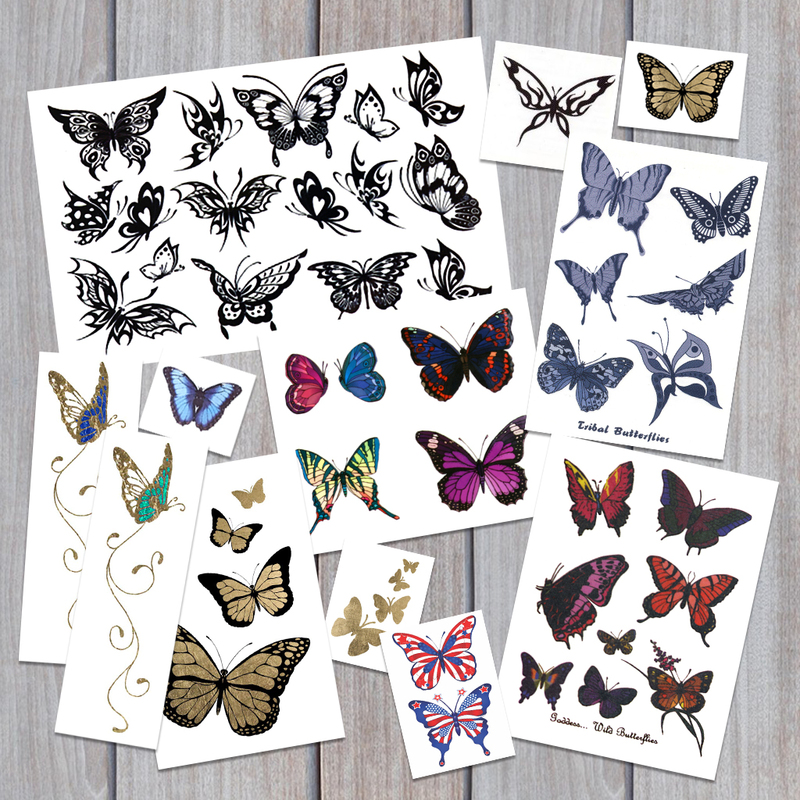 This pack features a large selection of butterfly temporary tattoos. From metallic to grayscale and black and white butterflies, whatever butterfly you want to wear is in this pack! The pack even features patriotic butterfly temporary tattoos. Each butterfly in this pack is unique, just as each butterfly in nature is unique. You’ll feel as though you can fly like the butterflies when you wear these Spring temporary tattoos. Another great option for Spring temporary tattoos is our Botanical Pack. 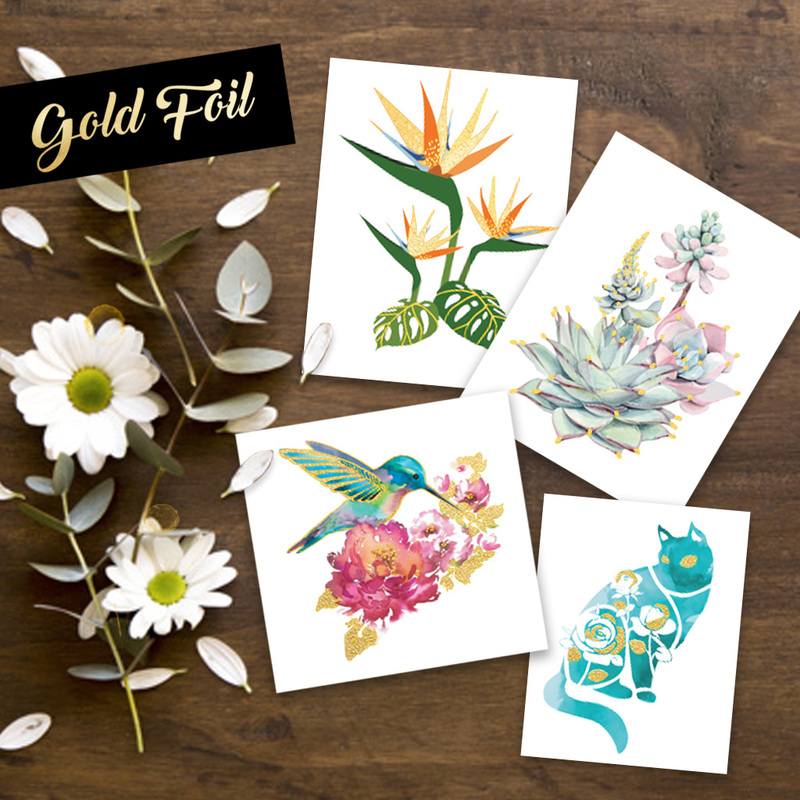 This pack features four spring temporary tattoos that are each a beautiful mix of color and metallic. These temporary tattoos are the perfect way to show your love for Spring. Featured in this pack are 3 large botanical temporary tattoos and 1 smaller flower cat temporary tattoo. Additionally, these temporary tattoos are sure to get you noticed at your next garden party. Another thing you’ll start to notice this spring is chirping birds all around you! 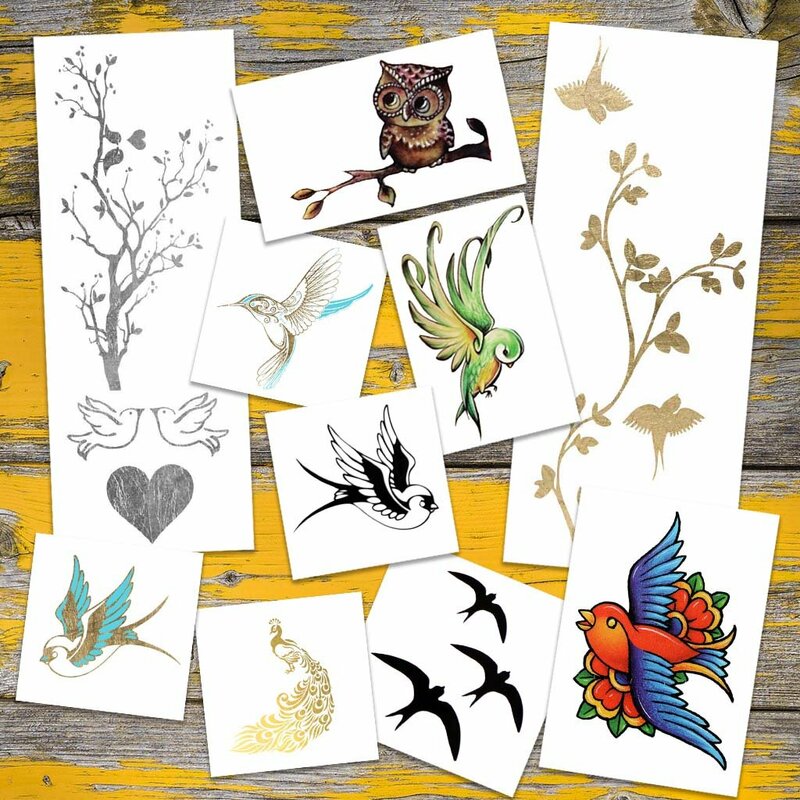 Show the birds how much you love them by purchasing our Bird Pack of Spring temporary tattoos. This pack features all sorts of feathery friends. From an owl, to love birds, and even sparrows you are sure to love all of these bird temporary tattoos. This pack also features a majestic metallic peacock temporary tattoo. 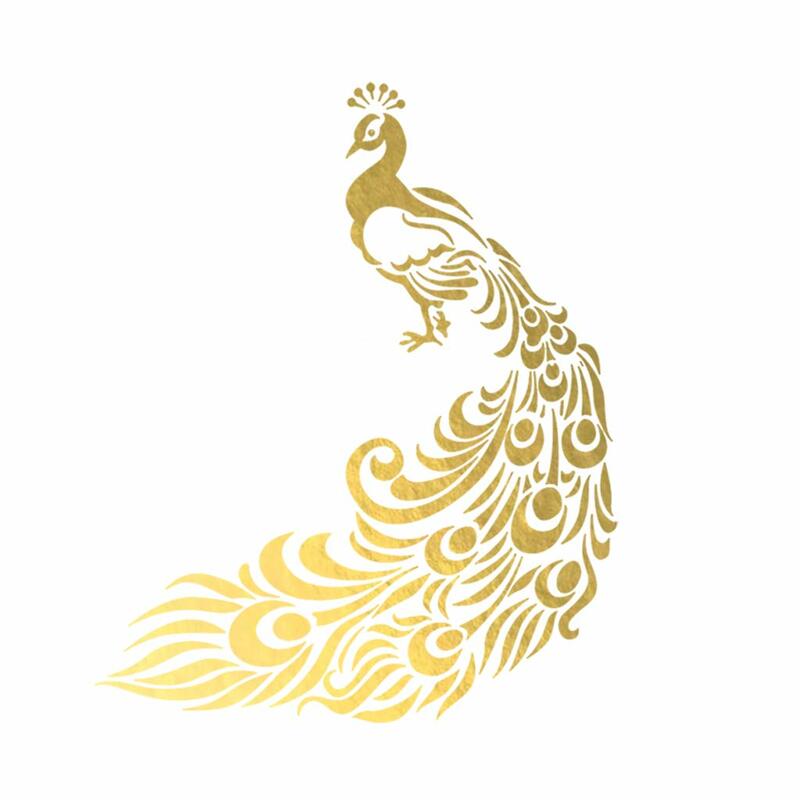 Like the peacock, you will surely get noticed when you wear these Spring temporary tattoos out and about. If you are looking for a custom Spring temporary tattoo for a party or event, reach out to us! We will be happy to help you design a custom Spring Temporary Tattoo. Our customer service team is devoted to giving you a great ordering experience. Additionally, our graphic designers will be there with you every step of the way. If you aren't sure what you want your temporary tattoo to look like, a member of our graphics team will be happy to help. We are devoted to make your Spring temporary tattoos a reality. All of these Spring temporary tattoos are easy to apply, and only require a little water! Simply put the temporary tattoo against your skin and apply a damp cloth to the backing for 30 seconds. The best part of temporary tattoos is that they stay on for days. However, you can remove them at any time with rubbing alcohol or, even just a little hand sanitizer. (There is also a special formula of temporary tattoo remover available). We’ve been in the Temporary Tattoo business for over 20 years. Thus, we know a thing or two about what type of temporary tattoos people love. We ship millions of temporary tattoo sheets all over the globe each month. Additionally, we make all of our temporary tattoos in the good old USA. We also make all of our temporary tattoos with skin safe, FDA approved ingredients. We offer the best quality temporary tattoos, every day low prices. Above all, we guarantee your satisfaction!